Yerba Buena Gardens is full of gems hidden in plain sight. Two spots worth discovering time and again are two of our favorites. Especially for Happy Hour. They offer dramatically different, yet unique experiences to mingle, dine, drink and relax. What they share can’t be experienced anywhere else in the City. SF skyline view with lush gardens at your feet. Both venues open to an outdoor rooftop terrace perched atop the Martin Luther King Jr. Memorial and Waterfall overlooking Yerba Buena Gardens. Complete with panoramic skyline views in the heart of the City’s cultural district, these great places to eat, drink or just hang out are steps away from the only green, open space and lush gardens in downtown SF. Two tasty options to consider. B Restaurant + Bar is a unique, contemporary bar and restaurant that was voted San Francisco’s best happy hour. It’s known for its seasonal cocktails, raw bar, and local ingredient menu. 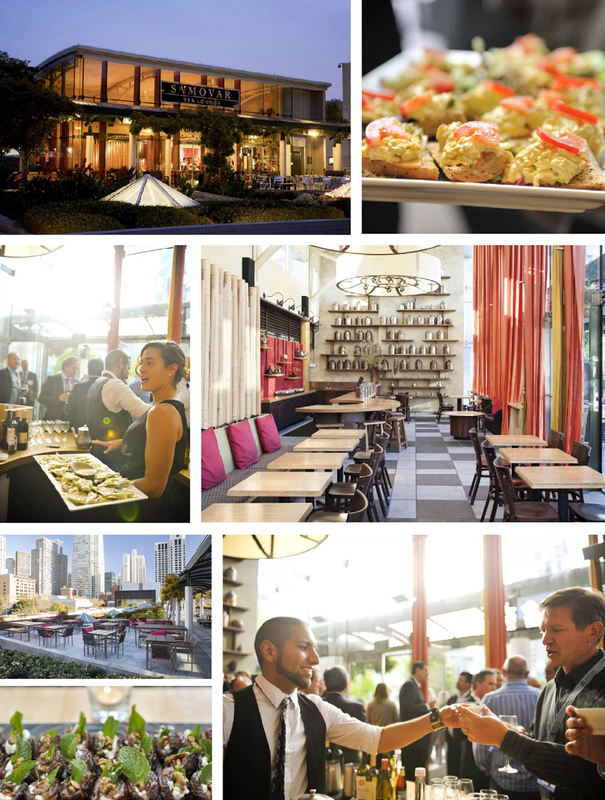 B Restaurant + Bar is located is located in Yerba Buena Gardens at 720 Howard Street, San Francisco. At the other end of the rooftop terrace is Samovar Tea Lounge. If you’re hungry and looking for tea, you’ll love their selection of organic, single origin and direct import teas, chai, iced tea, and herbal blends. They also offer a great selection of food, beer, and wine, like Butternut Squash Dumplings, Chai Pudding, and Tea-Smoked Chicken Salad Sandwich, to name a few menu items. Samovar Tea Lounge is located in Yerba Buena Gardens at at 730 Howard Street, San Francisco. Head up to the terrace level at Yerba Buena Gardens to enjoy all that we have to offer. Cheers!